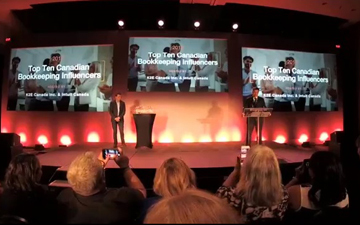 CALGARY, May 31, 2018 – The Top 10 Influencers in the Canadian bookkeeping world were announced this week at Get Connected Calgary 2018, presented by Intuit Canada. The inaugural awards, which included two chartered professional accountants, were sponsored Intuit Canada and K2E Canada. • Contribution to others’ success in the Canadian bookkeeping profession. • Impact on the continuing evolution of the profession. • Directly or indirectly contributing to the prosperity of Canadian small business. • Regarded as a thought leader in the bookkeeping community. • Helping to raise the standards of Canadian bookkeepers through education.